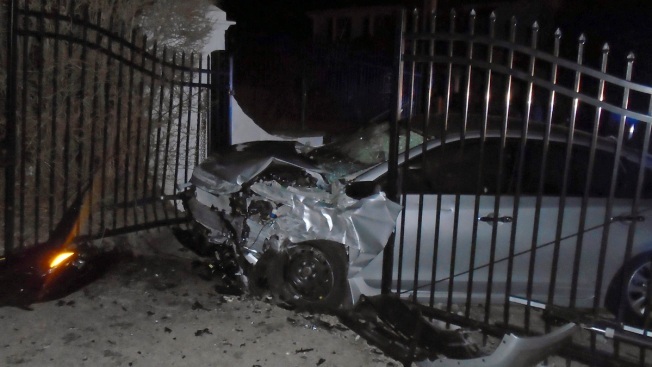 This Tuesday, April 2, 2019 photo released by the Hopkinton, R.I., Police Department shows a car after it crashed into the gates of singer Taylor Swift's beachfront home in Westerly, R.I. Police said the car was stolen in Hartford, Conn., and that officers from Hopkinton and Westerly pursued the vehicle with four occupants around 1 a.m. Tuesday. The singer was not home, though police do plan to ask for surveillance video from her property to help the investigation, Westerly Police Chief Shawn Lacey said Wednesday. The chase started around 1 a.m. Tuesday when a Hopkinton officer on patrol noticed the car had no license plates and tried to pull it over, Lacey told The Sun of Westerly. The pursuit, which reached speeds of 65 mph, crossed into Westerly, where Swift has a home. Swift has recently reported trouble with stalking, but Lacey said there's no indication that the occupants of the vehicle knew who owned the home. A message was left Wednesday seeking comment from Swift's publicist. The car failed to negotiate a 90-degree curve near Swift's home, struck the wall outside her property and ricocheted into the main entrance gate, according to police reports. Police estimated the car, which they said was stolen in nearby Connecticut, was going about 35 mph at the time. Three of the car's occupants — the 19-year-old driver, an 18-year-old man and a 16-year-old boy — were taken to the hospital with what were described as non-life-threatening injuries. A fourth occupant, age 18, fled on foot but was tracked down just after 4 a.m. Tuesday when his brother drove from Connecticut to pick him up. After the crash, police determined the car had been reported stolen, Lacey said. The driver, Shykeim Edwin Lewis, 19, of Hartford, Connecticut, faces several charges including reckless driving and receiving stolen goods. He was held on $10,000 bond after a Tuesday court appearance and referred to the public defender's office. A message was left with the public defender's office seeking comment. The car's three other occupants have not been charged, but police say the investigation continues.